← Are We Ready For Tonight? I wanted to predict the Emmy for Awesome Guest Actress in a Drama, and turns out the winner has already been announced even though the actual televised ceremony airs this coming Sunday! 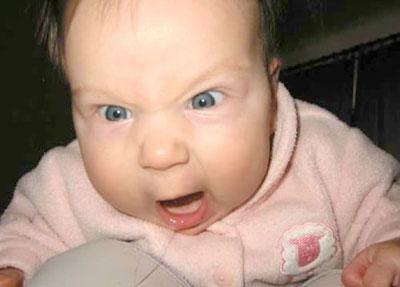 I’m pissed off too, angry baby. Well, we’re just going to ignore that sh– for now and allow me to dazzle you with my supreme intuition, or at least pretend to since I already know who won! Of these shows, I watch one: Game of Thrones. 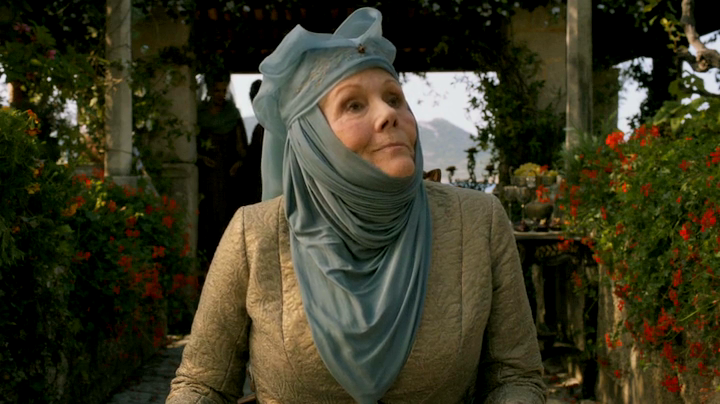 And Diana Rigg was simply DIVINE as the aristocratic Olenna. Way nicer than most royalty! I’m sure Joan Cusack was bitchin’ in Shameless because, hello, she rocked as Geek Girl in Sixteen Candles. Does headgear even EXIST anymore??? Carrie Preston is awesome in True Blood! She should totes win! I’m not even jealous that she’s married to Terry Bellefleur, who I think is SO hot! Oh wait, wrong show. She’s nominated for The Good Wife. Never mind! I’m sure Linda Cardellini is great in the most boring, overrated show of all time (Mad Men), but she’ll always be Lindsay Weir to me, bridging the gap between the Freaks and Geeks. Margo Martindale is up for her role in The Americans, a show about Commie spies in the early ’80s. I watched a couple of episodes and then got bored, but everyone else seems to love the show, so she’s got a shot. Finally, we have Jane Fonda as Leona Helmsley (I wish! ), I mean Leona Lansing in The Newsroom. Another show I started but could not get into because it was so goddamn smug. If you had worn this outfit on the show, MAYBE you’d have a shot. Who Will Win: Click here. Surprise! This entry was posted in Emmys and tagged Carrie Preston, Diana Rigg, Emmys, Game of Thrones, Jane Fonda, Joan Cusack, Linda Cardellini, Mad Men, Margo Martindale, Shameless, The Americans, The Good Wife, The Newsroom. Bookmark the permalink.